A Prayer is a personal communication addressed to a deity in the form of supplication, adoration, praise, contrition or thanks ­giving. But in Sikhism all other deities except God have been rejected. All other gods, goddesses, angels and the spirits are prone to death. Why should one serve or remember him, who takes birth and then dies down (Var Gujri M-3, p. 509). Even Brahmas, Vishnus and Shivas pass away after the lapse of their fixed period of life. ( 10 Swayyas Dasam Granth). Only one Lord will be there in all the ages. Who has not died and who will not die? (Maru M-1, p. 1022). Death is a certainty and the souls because of their actions undergo transmigration, the human being wears the garments of hath pleasure and pain, happiness and sorrow, (Var Majh M-1, p. 149), which he receives from the Lord, according to his worth. But the suffering mostly pervades in our lives. The so-called pleasures of the world also bring pain. As many are the pleasures of the body, so many are the sufferings (Var Malar M. 1, p. 1287). The sensuous pleasures result in sufferings and maladies (Basant M-1, p. 1189). Guru Nanak Dev has said, 'There is suffering in birth and suffering in death and suffering in all the dealings of the world" (Var Sarang M-4, Shalok M-1, p. 1240). "There is suffering in separation, there is suffering in hunger; there is suffering of the mighty Yama. There is also suffering caused by physical ailment" (Malar M-1, p. 1256). 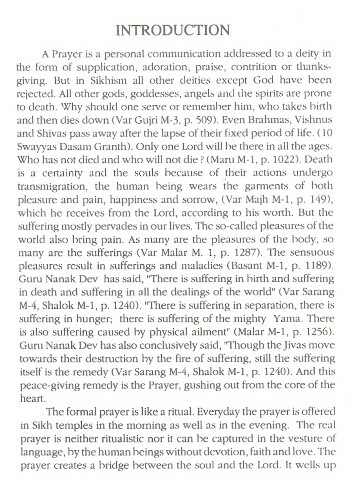 Guru Nanak Dev has also conclusively said, "Though the livas move towards their destruction by the fire of suffering, still the suffering itself is the remedy (Var Sarang M-4, Shalok M-1, p. 1240). And this peace-giving remedy is the Prayer, gushing out from the core of the heart. "Nanak Nam Chardi Kala, Tere Bhane Sarbat Da Bhala." 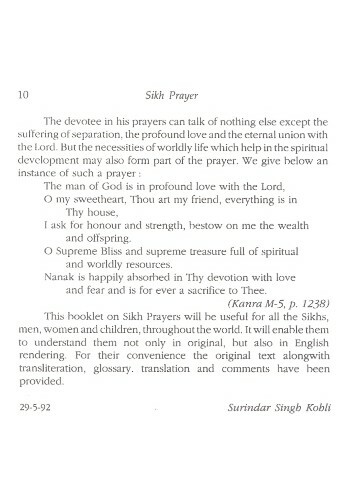 (The Name of the Lord emanating from the Guru (Guru Nanak) may bring high spirits and the welfare of all in his will). 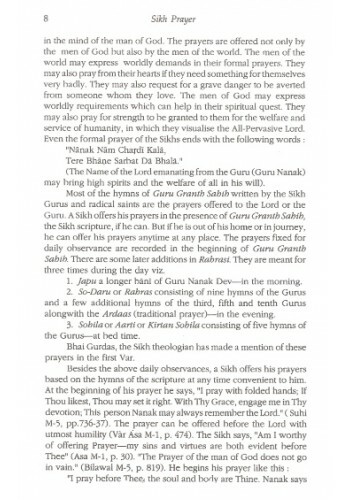 Most of the hymns of Guru Granth Sahib written by the Sikh Gurus and radical saints are the prayers offered to the Lord or the Guru. A Sikh offers his prayers in the presence of Guru Granth Sahib, the Sikh scripture, if he can. But if he is out of his home or in journey, he can offer his prayers anytime at any place. 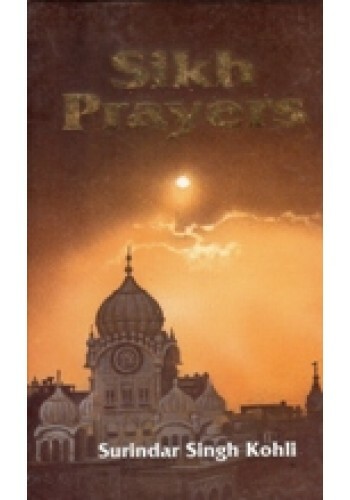 The prayers fixed for daily observance are recorded in the beginning of Guru Granth Sahib. There are some later additions in Rabrasi. They are meant for three times during the day viz. 1. Japu a longer bani of Guru Nanak Dev-in the morning. 2. So-Daru or Rahras consisting of nine hymns of the Gurus and a few additional hymns of the third, fifth and tenth Gurus alongwith the Ardaas (traditional prayer)-in the evening. 3. Sohila or Aarti or Kirtan Sohila consisting of five hymns of the Gurus-at bed time. 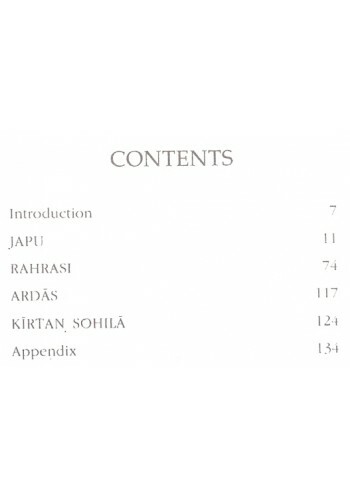 Introduction To 'Nitnem (Gurmukhi Roman) Gutka' The sacred hymns in the form of Gurbani, utte..
Summary of '1000 World Prayers' By Marcus Braybrooke A rich inheritance of prayers from the..